How has the landscape around Albersdorf changed over the past six millennia? What effect did cultivation of the land and grazing livestock have on the soils? Was there strong soil erosion in prehistoric times, the Middle Ages or the recent past? If so, did erosion over longer periods of time strongly change the landscape topography? How did man react to his changing environment? These questions were the focus of a study undertaken by the Archaeological-Ecological Centre Albersdorf (Archäologisch-Ökologischen Zentrum Albersdorf, AÖZA) and the Ecology Centre at the University of Kiel. A depression in the meadow was studied, where six exposures 20 m in length and 2 m deep were excavated. 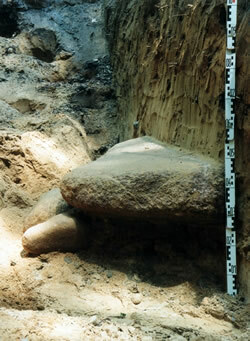 In one exposed pit a large heavy granite platter (fig. on the right) was found. The slab was over one meter in length, about 1 m wide and approximately 20 cm thick. It was transported downhill into the depression about 11 000 years ago, during a cold period of the more recent Tundra Age at the end of the last Ice Age (14-C-dating KIA 14415: 2 sigma range 9121-8740 cal BC). The development of all of the overlying soil layers shows signs of human activities. In two exposures four fire pits were found at one metre depth (fig. 2, 3, 4). Charcoal, heat-burst stones, and sand, reddened by fire, give proof of the immense heat in the fireplaces. Mainly flint and quartz stones were found in the pits. Between the rocks some pieces of broken ceramic remain. Physical carbon dating of the charcoal showed, that the pits are about 2500 years old (14-C-dating KIA 14413: 2 sigma range 764-407 cal BC). This places them into the late Bronze Age or early Iron Age. A few decimetres deeper, there lies a second, older generation of flat rectangular holes (fig. 3). One of these rather nondescript holes, which were filled with light grey material is clearly visible below the younger black layers. They were dug out about 5500 years ago in the Neolithic Age (14-C-Datierung KIA 14414: 2 sigma range 3641-3381 cal BC). After these older, Neolithic holes were filled the depression was used for grazing. Heaths developed, the soils acidified, and an acidic, leached soiled called podsol (fig. 3). Also after the younger, Bronze Age fire pits were abandoned further grazing caused increasing soil depletion, allowing heath vegetation to grow once again and forming another podsol layer (fig. 3). This second podsol layer developed in material which was deposited in the depression from the surrounding hill slopes after heavy rains (fig. 4). This kind of erosion could only have occurred on crop fields. Charcoal-flitters deposited in these sand layers where dated to the early Bronze Age (14-C-dating KIA 14571: 2 sigma range 1944-151 cal BC). This proves the third period of settlement at the site.